This is the second addition to the Embossing Powder range. 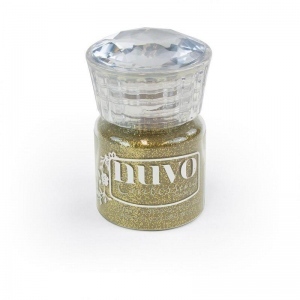 This is the one out of 4 in this range of Glitter Embossing powders. These are the first 4 Glitter Embossing powders we have made which consist of Gold Enchantment, Silver Moonlight, Glitter Noir, Shimmering Pearl. Each bottle comes with 22ml. These embossing powders can give depth and a 3D look to your crafting project. They are really easy to use all you need to do is use one of the stamps with either ink or an adhesive then pour some embossing powder on. Once it has stuck you then use your heat gun and you will get a beautiful 3D stamp print itäó»s that simple. You arenäó»t just limited with pre made stamps if you use one of our Nuvo Glue pens then you can draw your own shape to use these wonderful products with.